Top Nigerian travel bloggers resident here in Nigeria will be meeting up at Social Media Week (SMW) in Lagos this week, to discuss how to promote tourism in Nigeria through story-telling, the impact social and digital media on the travel, tourism and hospitality industry in Africa, as well as issues affecting domestic tourism in Nigeria. This event also serves as an opportunity for Tourism Boards, hotels, marketing companies, attractions/destinations and travel media to share ideas, best practices and explore how social media is being leveraged to grow the travel industry in Africa. 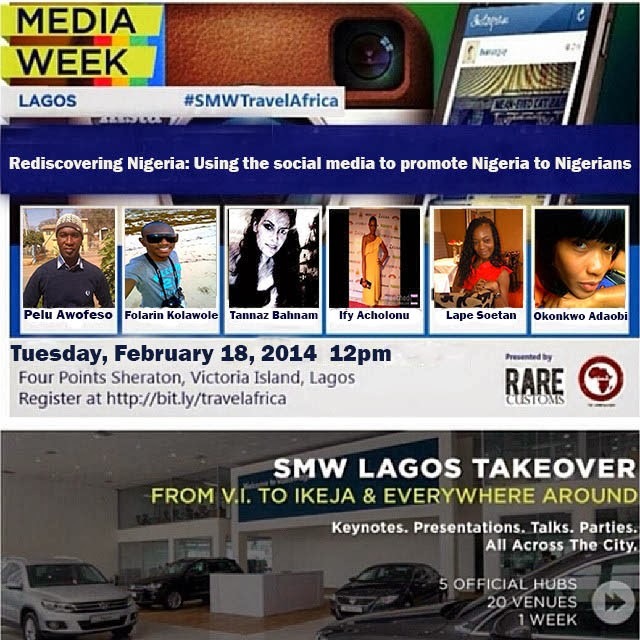 The event has been tagged #TravelAfrica Rediscover Nigeria… Using Social Media To Promote Nigeria To Nigerians and shall consist of a panel of top Nigeria-based travel bloggers and an audience of interested tourism enthusiasts. Date: Tuesday, February 18, 2014. Venue: SMWexperience Hub (Jupiter Room / First Floor) at Four Points Sheraton Hotel, Oniru Chieftaincy Estate, Plot 9/10, Block 2, Lekki, Victoria Island, Lagos. Speakers are: Pelu Awofeso (Travel Journalist, Homestead publishing), Folarin Kolawole (Travel Blogger and Founder ofNaijatreks.com), Tannaz Bahnam (Founder/Managing Director of Lost In Lagos), Ify Acholonu (Founder of Save our Treasures Heritage Foundation), Lape Soetan (Travel Blogger at www.lapesoetan.com), and Adaobi Okonkwo (Graphic Designer/Illustrator and Blogger at www.dobbyssignature.com). Hello Dear. Thanks for the info. Is the admission for tomorrow's event at Four Point by Sheraton free? Or are other Bloggers to pay for registration? yes it is free. All you have to do is to click the link below the "Event title" Above to register. Yes its great idea ..